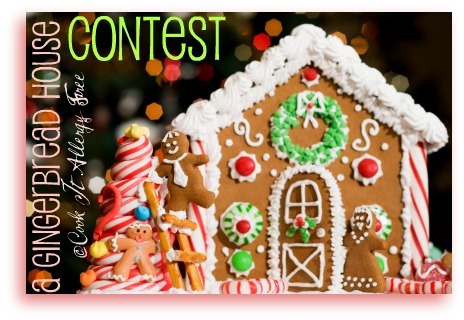 Cook It Allergy Free Gingerbread House Contest-Vote Now! 2 UPDATEs: 1) VOTING FOR THIS CONTEST HAS ENDED. ANY VOTES RECEIVED AFTER THE PUBLISHING OF THE UPDATE WILL NOT BE COUNTED…2) THE BAKERS HAVE BEEN MATCHED WITH THIER HOUSES BELOW!!! I had planned on having this post ready to go live on Friday Morning. Life did not go as planned…or really how we would have ever hoped. Instead I was in the hospital praying for my sister’s life. Literally. I have not been able to focus on anything else while she has been in the ICU. Family is first. My sister is my best friend. Blog happenings have had to wait. Luckily, my sister has crossed over from the scary side, and we are now just focusing on making her better. And since this hospital has free wi-fi (it better, considering it is one of the top in the country), I am finally getting this contest rolling. We have had some amazing entries. Everyone has told me what fun they have had while building their creations. Wonderful memories have been made. Too much candy has been eaten. Many messes have covered counters. Sugar highs are just finally fading. And now… it is finally time to unveil our BEAUTIFUL entries and see who will win this iPod Touch and a free download of my Cook It Allergy Free iPhone App!! I am listing our contestants here, but will not match my busy little bakers with their houses until the last day of the contest, when the winner is announced (this is in the spirit of trying to keep the voting fair). Instead, it will be the job of our contestants to help convince you to vote for them. They may blog, or tweet, or facebook, or email about their houses to get the word out. However they do it, it is still up to you – all of my loyal readers -to vote, by number, for your favorite one. I will list the rules for voting below. CONTESTANTS: Note ** Contestants have now been matched to their houses! 1. Houses are in no particular order. 2. You may vote, BY NUMBER, in the comments section below. The number is above the picture for each house (so make sure you are voting for the right one). YOU MUST ALSO SAY WHY YOU ARE VOTING FOR THAT HOUSE. 3. You may vote 1 time PER DAY. Last Day of voting will be December 16th with the winner announced on the 17th. 4. Contestants CAN vote for themselves. Now GET VOTING! May the best house (and it’s baker) win!!! Now start voting! Share the word! May the best house win!! 2 UPDATES: 1) VOTING FOR THIS CONTEST HAS ENDED. ANY VOTES RECEIVED AFTER THE PUBLISHING OF THE UPDATE WILL NOT BE COUNTED…2) THE BAKERS HAVE BEEN MATCHED WITH THEIR HOUSES! # 13 gets my vote! While I am voting for #9, I noticed that one of the “houses” is missing. Eh-hem! My vote is for #11. It looks real! #16 gets my vote, hands down!!!! Oops! I forgot to say why I was voting! I am choosing #15 because it’s mine and it made my kids so very happy! It’s not only gluten free, but corn, dairy, egg and dye free. My allergic little boy doesn’t get to have very many treats, but he sure did enjoy digging in to this one, and so did his big sisters! #11 Definitely! Looks so real and it must of taken a long time for all the detail! I am voting for #5 because I know how many hours it took my wife to make gluten-free, dairy-free, egg-free, and corn-free gingerbread and icing. I also know that I got to have cereal for dinner that night, so my vote should count twice. the little people are so cute and it looks like it was made with such love. I vote for #13 because I saw it done in the middle of finals week, with a bronchitis, at the end of a very challenging college semester ,medically speaking. I vote for number 2!! such cute design and perfect for the little one. I vote for #2! It’s the cutiest!! # 11. I love the simplicity and realism. Slapping on candy is fun, but thinking it through is a creative joy! Way to go #11!! #9! the detailing is amazing! I vote for #3 because it is so cute! I am voting for #3 because I like the little people. I choose 13! Because it reminds me of a little log cabin! I vote for # 10 b/c my daughter and grandkids made it and they are awesome! I vote for #3 because the little people are so cute. I’m voting for number 4 because it was made primarily by my 7 year old! #2 I vote for. It is so darn cute w/little one in it too. #15 Love the train! Gives it a different feel from just a house! But they are all great. I vote for #2 Is my fav. I voted for number 12 because I like the roof and the use of the pretzels for the fence! Very creative! I love the look of the little white balls on the icing and marshmallows, it reminds me of a crisp beautiful winter morning! My vote is for #12! # 12 – love the pretzel fence! I vote for #10 – cute and clever! House #3 because it was made by my nephews. I am voting for Gingerbread house #3 because it looks like these little boys (my grandsons:)) put a lot of thought and prayer into winning! I know they did! They want to win so bad and LOVE Kim with Cook It Allergy Free; they want to make her proud. #4- way to go, Deanna! #10…look it’s even got a pond! 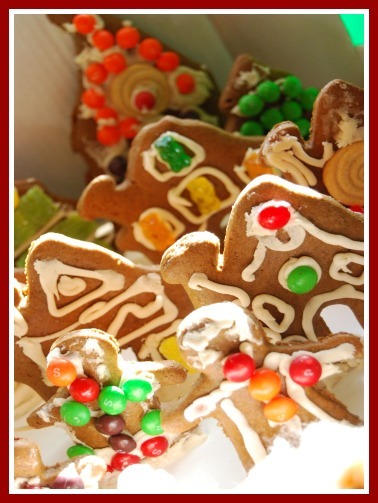 #10 Neighbors in a Gingerbread Village….did somebody eat the carolers?? Voting #9…….Someone has talent! The house is beautiful! #13 – Ingenious. Gluten Free, egg, dairy and corn free. Amazing that little ones can build something like this and be so artful. I like the vegetable garden and the roof. I vote for # 10 b/c it looks great!! I vote for #10 b/c it has so much detail. Love the mail in the mailbox! Can i vote for two of them? I love numbers 7 and 9! The Charlie Brown characters are adorable and the other is so professional looking! Kim, I’m amazed that you could get this together will all that’s been going on. Continuing to send lots of love, hugs, and prayers your family’s way! I like #3 because the little people are adorable and I like the snow. I vote for #3. It is my favorite! I vote for #13 because I have seen it built :gluten, dairy, egg, nuts and corn free. I vote # 2 cuz the lil helper is so cute!!!! I vote for #7 because Snoopy and Charles M. Shulz helped teach me to read. I just love #15. The simplicity of the gingerbread and white is wonderful. 13 is my favorite so gets my vote. LOVE the marshmallows and pretzel fence in #12! # 16!! 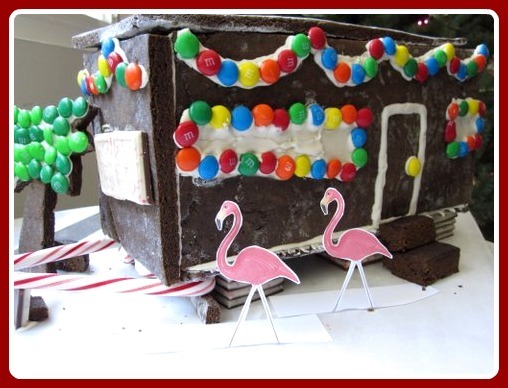 A gingerbread trailer with pink flamingos! FUN!! Wonderful, letting us know the “door is always open” Great Design!! I’m voting for #16!! So cute. #3 – It is adorable! As is my great-niece and children who created it! Love love love it!!! My vote is for #3. I love anything gluten-free and that house is so cute!!! My 3-year old votes for number 13. Looks like real kids might have made this one! I love #3! I like the triangular shaped house, and the cute people outside of it! Good job!!! For sentimental reasons – Snoopy and the gang get my vote (#7)! Love it! Good thing I can vote more than once because there’s a couple I like. Today I am voting for number 5 ’cause I like the whimsy of having a gold fish over the door. So cute! Love the Charlie Brown theme! I love two of them so will be back to vote for the other one. 🙂 But, today it’s number 7 because I love Charlie Brown and it is so out of the ordinary. #13 gets my vote! WAY TO GO!! I vote for #7 because it looks fabulous and was created by an amazingly talented woman! I also happened to see the huge blister she got making it and she deserves to win after going through that! I vote for #14. Winning this would make a 7 year old boy the happiest kid on the block. ;-). GO #3!!!!!!!!!! The house looks amazing and the little people are so cute!!! I vote for #13! Whoop whoop MC!!! #7 – Amazing! Charlie Brown is the best. #13 is my vote. Cause it has snow on the roof. I vote for #2…how cute!! #7 – I love the way that icing transfer technique looks and works….and Charlie Brown is now a Christmas icon. I vote 14 – I love that it’s a complete village with lots of little houses and trees. Looks delicious too! just ordered the movie for my kids and we watched last night. This house is a sweet and different take on tradition! #9 please. A house I could with and in, beautiful! I vote for #7. It is adorable and the message is great. very hard to choose i love #4 but #9 has so much detail; the others dont hold a candle to it! #9 for sure! This is one is the BEST!! 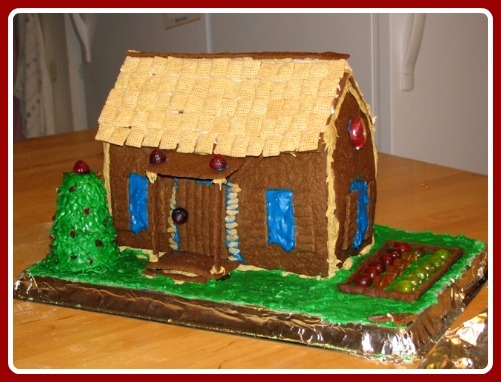 #9 gets my vote, because its the Gingerbread House I always aspired to make! #15 – love the little train! My vote is for house #3! What can I say, I am married to an architect! # 14 for sure- that´s a village I want to live in!! I think that number 9 should win! I vote for #9, awesome!! I have to vote for number 7. I am the biggest Charlie Brown fan. The display is AWESOME!!!!!!! I vote for #14, really nice. I vote for #9. It is well, done, neat, and the attention to detail amazing. it looks as if it came from a professional bakeshop! Love it! We love #14. Great job Caspian and Nicola. #9 is obviously the best! #10, I vote # 10 !!! It’s hard to decide but I vote for # 7. That took a lot of work! #12 please. Go Callum go! #9- it looks like a fairy house!! beautiful!! #16, I forgot to input number on previous submission. I vote for #14 🙂 Just love the colours and the fact that it’s like a little scene where you can play with the gingerbread figures! Number 9 – It’s gorgeous and that roof is spectacular! #10. It is the best looking one! #9 for sure! It’s beautiful! Oh, and kind of regretting that I subscribed to comments. My inbox is so full. I am impressed by the attention to detail. #7 – Who doesn’t love Charlie Brown?! Definitely #9. It’s absolutely gorgeous. I vote for number 9. What a gorgeous gingerbread house..
One vote for No. 6! I like its inclusiveness, and the grandness of creation and display. All the bakers deserve huzzahs. This one reminds me of a really important theme, for all times of the year, heightened this time of the year: harmony in a world of differences. Best holiday wishes to each and all! House #6 it shows the multiculturalness that everyone should he taught and understand. # 11 It is the most creative with 3 dimensional. Boy some thought went into it. Ours have never looked that good. 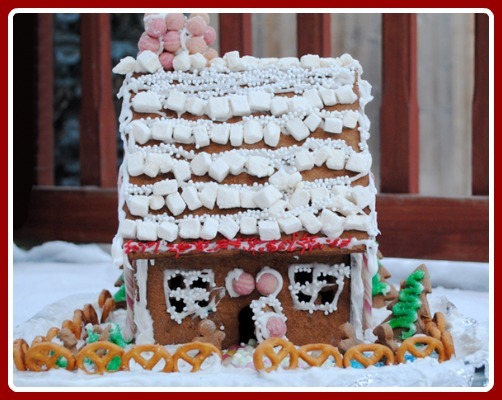 #9 is what a gingerbread house should be! I vote for #14. Merry Christmas from Berkeley! Wow, this was really hard! They’re all so cute! I’m voting for #15 for its originality. # 9 is beautiful!!! It looks like the gingerbread in fairy tales! Full of sugar & spice & everything nice! Still loving #5. I think the best part for me is the “lights.” Just makes me smile. #10 – without a doubt. Who wouldn’t vote for the North Pole gingerbread house! #9 is absolutely beautiful, #2 really captures the spirit of gingerbread houses BUT #16 has to get my vote for making me giggle – love the flamingo / palm tree twist ! Sidenote – Kim our prayers our with you & your family – I hope your sister has a speedy recovery!!! My vote goes to #9. Very intricate and detailed. The roof is the best of all. I love number 9, but my vote is for number16. It’s so much more fun! #9 is my favorite because it is so detailed! They are all beautiful and I can’t imagine spending the amount of time that went into them! Good job by everyone! #7 I have a Charley. He is #7 of 7 kids. 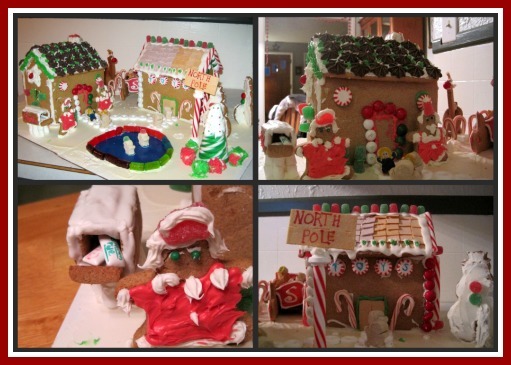 I vote for # 9 – lots of detail and color!…beautiful ginger bread house! My vote goes to #10. I LOVE Charlie Brown, huge favorite of mine growing up, I still watch all of the holiday specials, so for sure #8! Vote for #7, being that we have had a Charlie Brown christmas tree for years! I’m voting for #12 – I love the Christmas Tree on the porch!!!! 9 is gorgeous, and 16 just cracks me up, but for the sake of the traditions of the season and the cute little details my vote goes for #10. Love it! I’m thinking number 9 should be your winner! Everyone else did great, too! I vote for #7. Snoopy has been a favorite of my since I was a child. I vote for #9. It has excellent attention to detail! My vote goes to #9. It looks like a gingerhouse you dream of. because of the frost on the roof, the icicles, and the lights (both along the edge of the roof and within the house). #7, please, because it is phenomenal! 13 is quite cute.. a lot of heart. Definitely #14! Such an original piece! Ooh, it is a really tough call! I’m going to vote #9 since I wanted to reach into my computer and grab a bite when I saw it! So glad your sister is improving. Your family is still in all of our thoughts! My vote goes to number 14 becase it looks colourful and really cool. # 3! They put their heart and soul into it with great anticipation of winning! I am voting for no.14 because it shows unusual imagination – a whole ‘village’ rather than just one house. A very good idea. I vote on no 14! #7, I love Charlie Brown Christmas, and can’t wait to watch it with the kids again this year. Number 14, just looking at this little village cheers me up. #12 please. It’s all about the chimney that almost ended in disaster! Voting for #16, simply ’cause it makes me laugh and isn’t that what makes the holidays fun? Like I said, #10!!!! Great house!!!! I vote for number 9, I think it’s the best one there…. I’m voting for #10 so my sister doesn’t yell at me for not voting. I vote for number 3!! I still am amazed that these are allergy free creations I am voting for #7 gotta love charlie brown and the gang.. still puts a smile on my face. Voting for number 7. “You’re a Good Man Charlie Brown”!!!! #10 is my vote b/c my wonderful sister made it! I vote for # 10 – North Pole should win!! My vote is for #3 ! I vote for #10. I love that it has skating elfs! I vote for number 10! Voting for #1! it has nice lines and I like the snow on the roof. And it’s got a moose. You can’t go wrong with moose! a new day, another vote for #10 !! My vote is for #10 — love the mailbox! #12 is my favourite because I know the decorator and his mother very well!!! #16 !! Still LOVE it!! #9 the detail is incredible! #14 looks like the village where the party’s at! We love #14 because each little house is different and fun. #11 I like the way you think outside the box not your average house love it! I LOVE #7 but #9 has got my vote! stunning! #11 because it is simple, but cozy. I would want to live there, except I’d eat myself out of house and home! 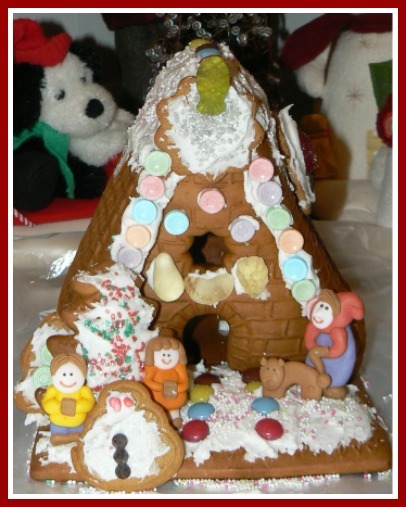 Number 9 – it is my conception of a ginger bread house – well done! #9 An amazing roof. Very well done. got to love me some # 9! I’m voting for #11 because it looks like a real house! I love that the house has Christmas lights on it! There is even a cute porch with a tree, and snow on the roof. This house reminds me of a beautiful and happy Christmas morning. What a fantastic gingerbread house!! This is really tricky. I have two that I really like a lot. Is that legal? #7 because a Charlie Brown Christmas is Classic, and it obviously took a lot of effort to get those images exactly right. 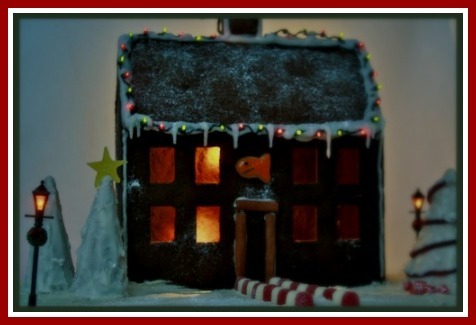 It is adorable, and a different interpretation of a gingerbread house. #9 because it is beautifully done and very old world. It would be nice to know a little about how each house was made, was it done from scratch and put together with icing or burnt sugar, then decorated. All of this has a huge effect on the amount of effort each one took. I spent many years making gingerbread houses and know what goes into a scratch house, so I am much more impressed with those who take the time to do the whole thing from square one without molds or kits. Do you split the categories up into kid ages and adult? That makes a difference, too! number 9! It is just so detailed and it deserves to win! All the teaditional ones are nice – but lets have something different for a change #7!! Number 16 is hilarious, but my vote has to be # 9, so perfect! #9 it is simply fantastic!! #10 – I love the North Pole! I love the detail in #9….it gets my vote…..but everyone did a great job. #12 – love the snow covered roof! #15… love the fact that there is a train and a train station. very unique take on the ‘gingerbread house’. I vote #7. Snoopy is a big hit with my kids. #14 is my pick! It’s a delicious village. #9, so detailed and pretty. I vote for #7! 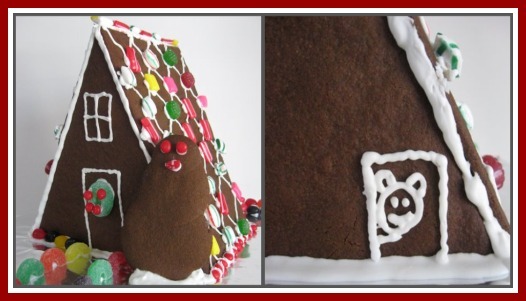 A Peanuts Gingerbread House is a fantastic idea! # 12 – I’m in love with it! #1 nice attention to detail…I vote for #1 house. I vote for #7 because a Charlie Brown gingerbread creation is extremely creative and challenging and the results are amazing. I vote for number 13! I love #15 the Train is so cute and it reminds me of the 1st Train around our tree when my son was about 3 years…Nicely Done!! I vote for #7, I have always loved Charlie Brown’s Christmas, what this person created is amazing, colorful and challenging, so I say #7 should win…Good luck! #10. How do you get the frosting to hang like that? Love Charlie Brown! #7 gets my vote! I gave my vote to my kids- They agree on #1. #11 – I saw this in person. It is awesome! number 9- it’s so beautiful and professional looking! # 11 it is so real!!! Today I would like to vote for #12. 11! It is structurally very sound! #9, it is so well thought, just beautiful! I’ve got to go for number 9.
number 14 because it’s a new take on the idea of a gingerbread house. I think I voted in the wrong place, so I vote for #9 with the beautiful details it should be on a magazine cover! Number 14 because of the amount of work that has gone into making it. #3!! It is so cute and I know how much work and thought they put into it!! I vote for #12 because it is a work of love!!!!!!!!! i vote for number one! The other Peanuts may not appreciate Charley Brown but I do. He deservies some attention in a good way. ACK that should have been #7 with Snoopy – Sorry! #7, It’s not just another house. Unique, creative, and totally gluten-free and edible. My vote is for #10 because it’s so creative! No. 14 because Caspian has done a great job with the village. Pity about the photography though! Voting number 9, it’s so intricate and detailed! Just love it! Number 9. Just love everything about it! #7 A Charlie Brown Christmas A lot of work went into this with the transfer method and attention to detail. The characters really look like they are supposed to look, and I just LOVE Snoopy’s Dog House!!! No. 6. First, it captures the full spirit of the season. Second, it is of master chef quality, with healthful ingredients. This house has many rooms…. My vote has to be for number 9. This was so hard, but I ADORE #16! Loooooooooooooooooooooove the flamingos! 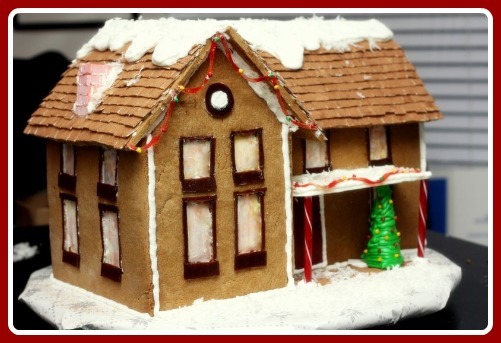 Making a trailer home is a great take on the traditional gingerbread house! # 9.. it looks WONDERFUL! I absolutely LOVE number 9! my vote = number 9. My dear friend made house number 9, and in my opinion it deserves to win! I’m voting #9 all the way! #16 shows the most imagination and looks the most delicious. #16 gets my vote! #14 I suppose that he has made the village himself. I want to live there. He should help me to make my ginger breads. #7 – Love Charlie Brown’s Christmas!! Sorry #8 because its awesome and I love Snoopy!! #10! #10. that’s my favorite! #3 – definitely the cutest, most creative! As well as the cutest boys and their mommy building it. #14 all the way. Looks yummy. I vote for number 9… It’s my favourite.. Nothing else comes close to #7!! #7. Because Snoopy’s house looks just like a Sopwith Camel (if you use your imagination). i vote for # 7. #2 Should win…what a cute house and cute little girl! # 9 gets my vote….just lovely…..good job! Today I vote for #14. I am voting for Tia’s today – #16. I just love the trailer idea, so original! I like number 13 the best, especially the “thatched” roof. # 9 …its so awesome. I am so voting for #9, so original and cute! #9 is so well made, so great.! number 9 is the best one in this competition! my vote is of course #9!! I vote for #7 because she made the best gingerbread creation of all…. I’m voting for no.14 today because of its impressionist interpretation of a village. Monet beware! My vote is for #10, it looks great! I vote for #10, I love the mail in the mail box!! #3 because they are sooooo excited and hoping that they will win! No. 10 is absolutely gorgeous I want to live there; but no. 3 is so adorable it makes you think of the old world and Hansel and Gretel. What a dilemma! I think no.3 because no one seems to be giving it as much love as it deserves. certainly deserves to win..saw Charlie Brown and gang creation in person and it looks great!! You know, this is really a hard decision. Every time I look at these I see something new and wish I could vote for more than one. I love #7 best, but #9 is lovely, too, and 12 is so realistic. Then there’s the obvious joy of the children in their creations. Decisions, decisions!! For future, please have a section for the kids and one for the adults. 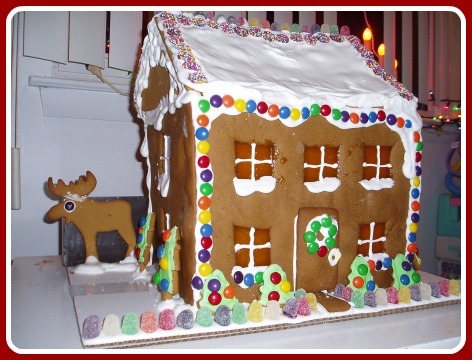 The difference in how a child sees a gingerbread house creation vs. an adult is significant and shows in the end result. I vote for #12. It looks like such a cosy little gingerbread house! Good Grief, Charlie Brown – #7 for me! My vote is for #7 please. got to go for number 9…. Love me some # 9. So in love with number 9. Voting #9, it is just so fantastic, and if you’re voting purely on talent it should win. going for number 9! It just amazes me more every time I see it! Number 9, so great, it makes me so happy to look at it! I vote for #13. It is the best! #13 is my vote. Go green! #7 Traditional is fine, and A Charley Brown Christmas is now traditional!! #13 is my choice. I want to eat it! #9, it amazes me how talented some people are! number 9, it looks like a gingerbread mansion!!!!! I just love to look at all the houses, but my vote is #9! Giving vote love back to Tia today. #16. It rocks because it is so original. Love the flamingos. a vote for #9 please! What a fun contest! Am loving #14 and #15! I liked #1, I’m a big fan of the traditional gingerbread houses. Number 9, it is beautiful! I vote #9, Classic design and clean details! #9 definately, the cook/artist has great talent. # 9 is the best–great detail; sharp, crisp lines; attractive use of color and texture. I vote for #9, the detail is amazing! Number 14. I bet it was fun making a whole gingerbread village. After reviewing all the photos, a clear winner stands out to me. I vote for house #9. The beautiful detail work stands out from all the others. The roof is exceptionally lovely and great icecicles hanging down all the way around. #9 is exceptional! See how sturdy her house looks as compared to some of the others which look a little or a lot unsteady. I want to live there!!! I loved #12. The roof with the bit of snow looked very authentic. I also loved the realistic looking house. I’m voting for #12 because the marshmellow snow on the roof rocks! voting #9… I want to eat it, it looks yummy! I love all the houses, but my favorite house is number 9! #9! I love the attention to detail! Number 9. The roof is spectacular! Absolutely #9. i love the chimney! I vote for number 9….because it’s just so beautiful…. I vote for #7 – too cute! I vote for #9! looks great! I vote for cute house #1. Great job! #14 Good luck ! You are the best !! I really have to go with #9, because of the sheer amount of candy involved, but I am mightily impressed by all the contestants. I vote for number 7 … I like how neat, tidy and tasty looking it is! No 9 because the detail is great !!!!!!! Vote #9 Very beautiful work! My vote is for #9. Number 9, it’s so precious! # 9 has my vote! So much color and detail – Beautiful!! Number 10 has my vote……loved the detail and the pond!!! I am voting #7. Have always LOVED that Charlie Brown Christmas!!!! #10 Rocks. I love the pond, but you need a swimmer! #7. Because it just looks so good. Just like the Christmas TV special. I am voting for No. 10, the ice skating rink is fun! #9 has my vote FOR SURE!!! voting number 9.. i love the walkway..
Love the whimsy of #10! I will give my last vote to #12. C. would be so excited to win!!!! I love number 9, so cute!! #1 I love the colors and especially the moose! My vote goes to #9, the roof and chimney are amazing! # 9 is the winner in my book! 7 7 7 7 7 7 7 7 7 7 7 7 7 7 7 !!!!! Go Snoopy GO!!! absolutely voting 9.. so precious. Definately #9 beautiful details love it! How did # 7 become # 8? Snoopies doghouse reminds me of WWI, when groups of uncommon foot soldiers laid down their arms and had peace.. Until their (a-hem) superior? officers forced them to resume fighting. Let there be Peace on Earth for everyone!! I am voting for No. 14. 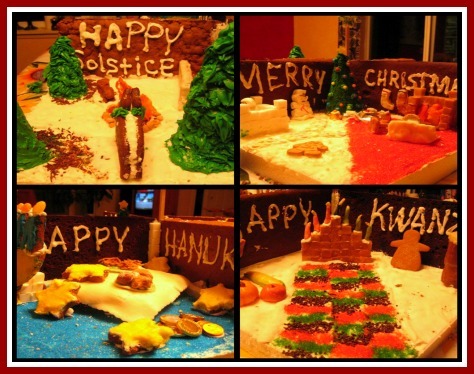 What a great idea to bake a whole ‘village’ of gingerbread houses. Very neighbourly. A great effort and an inspiration to others. No. 9 🙂 so amazing. I vote for #9 – it is beautiful!! My vote: Number 9. I still can’t get over the detail work! It amazes me. The one i am voting for is the most spectacular house in this competition, and it’s # !9! I love #9, the person that made it deserves to win the ipod. Cause I know i’m not talented enough to make a house that gorgeous! Still going for #7! Charlie Brown is classic! My vote is definitely for #7. The Charlie Brown theme is adorable! I’m voting for no. 5 because all those twinkling lights look inviting on what must be a dark and stormy night. I’m supporting #13 all the way. #13 seriously needs to win!!! # 13 all the way!! Number 14. Well done Caspian! # 14 You are a future designer !! I still vote for number 7. It’s so unique. #13 – looks cozy… I can just imagine going in after sledding! #7 is my favorite-I love snoopy! Every one of these made me smile for one reason or another. They’re all great, but it has to go to #10. I’m so impressed! I made graham crackers once and that about did me in, so I have a great deal of respect for every person who attempted this project. Oops, I just reread your instructions and I think I meant to vote for #9! Yikes, the number is ABOVE the house. I love the icicles and all the snow. That house just looks like a Christmas scene. All of them are awesome, but #9 is just so Christmassy and snowy. I love it. The kids say #9 is their favorite! #6- I love that it honors all traditions! #6- Cool design and inclusive of all. I vote for #7. I love the Charlie Brown theme and beautiful icing. Love that north pole! voting for #10! voting for the best one on here.. #9! I hope to see number 9 win! I think she deserves it not only on talent, but on creativity too! I love it! #9… I still want to eat it!! hahah..
No. 6 soars with the spirit of this time, and all times, of the year. I vote for # 6 . . . nicely done. #13 is the way to go! Number 13 Really needs to win!!! I am voting for 15 because it is the best one!! 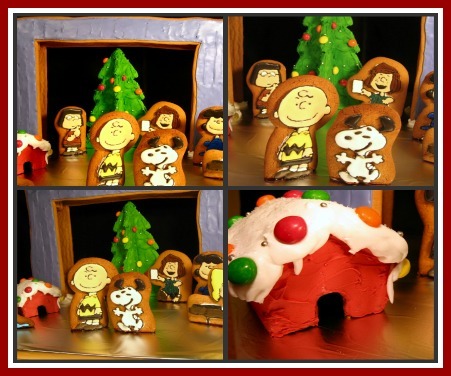 I vote for #7…..who doesn’t love a Charlie Brown Christmas? Besides, she did an AMAZING job on the royal icing transfers. Way to go, Jeanine! Your email is never published nor shared.